If you have been following this blog for awhile, you already know how much I love iS Clinical. The word simply continues to spread as they were recently featured in Marie Claire magazine. And which three products were featured? Only my three absolute favorites that we have blogged about probably at least three times: Active Serum, Pro Heal Serum Advance+, and Hydra Cool Serum. 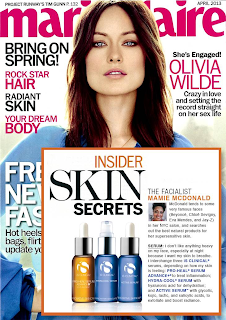 In the above edition, Marie Claire interviews aesthetician and spa owner, Mamie McDonald. Mamie has been working on a slew of celebrities skin for almost twenty years. A listers such as Beyonce, Jay-Z, and Eva Mendes (just to name a few) have entrusted Mamie with their skincare regime and often frequent her NYC spa. During the interview, Mamie raves about iS Clinical and states why she suggests these products to many of her clients: "I don't like anything heavy on my face, especially at night because I want my face to breathe. I interchange three iS Clinical serums, depending on how my skin is feeling. Pro Heal Serum Advance+ to heal inflammation; Hydra Cool Serum with hyaluronic acid for dehydration; and Active Serum with glycolic, kojic, and salicylic acids, to exfoliate and boost radiance." I have to say that I am patting myself on the back (just a little bit) for having recommended these products to so many of our clients. The results simply speak for themselves! I mean, who doesn't want skin like the absolutely gorgeous Beyonce and Eva Mendes? I know some of you may be checking out the price and thinking that these three amazing products are out of your price range....but, hear me out for just a second. If you haven't used any serums before, then do keep in mind that the products will quickly absorb into your skin and with iS Clinical products, it takes only a VERY small amount. My husband and I share these products and we have had the same bottle of Active Serum for almost six weeks now with a little over 1/3 of the bottle remaining. In addition, you really gotta try these products for yourself. The results are amazing and I would be shocked if you weren't hooked with your very first purchase. If I had to suggest at least one of these products to try (which is difficult since I love them all), it would have to be Active Serum. This product literally is a 3-in-1 since you can use it for acne, anti-aging, and hyperpigmentation. I have been a Active Serum guru for over five years now and I can't say enough great things about it. I use it weekly to keep my pores small, my skin tight, and for the occasional blemish. Hydra Cool is a fantastic option for oily prone skin, that still needs moisture, but not the clogged pores that so often come along with your traditional moisturizers. I love the serum because it is light weight, absorbs quickly, DOES NOT break me out, and rehydrates my skin perfectly. And.. you can't forget about the Pro Heal Advance+. This product is my saving grace for when I go a wee bit pickin' crazy on my face. Note here: picking is never recommended and I know I shouldn't, but we are honest around here, so I gotta be truthful! It almost seems like once I start trying to extract that I simply can't stop and go overboard. This leaves me with not only a ton of red marks, but often times even scabbing as well. The Pro Heal Advance + reduces the healing time by at least half. I honestly think even less in most instances. I have done some doozies on my face in an evening, realized my mistake and run to grab the Pro Heal, put it on and typically by morning several of the irritated areas are gone or pretty darn close. Again....the results of these products speak for themselves! That being said, I have THREE FREE SAMPLES OF EACH PRODUCT TO GIVE AWAY! We will randomly draw winners within a week of this blog posting. Winners will be contacted via email and will also be announced below once selected. Remember too, that if you order $75 or more of iS Clinical products and use code: SOCLEAN you will receive a FREE travel size iS Clinical Cleansing Complex. As always, if you have any skincare, haircare, or nail care questions....would like us to do a specific how to, or product review...just respond below and we will be happy to write about it. I seriously LOVE everything that I have tried from iS Clinical. I would choose Hydra Cool first, but it's almost a tie with the Active Serum! I hate to admit it but I've never tried anything from iS Clinical. If i could choose I'd love to try the Active Serum, it sounds like that would be the right fit for me. I love exfoliating products and who could not use some extra radiance? I need an anti-aging product that is not too harsh on my sensitive skin, that is prone to break out. I have never tried any of the product from iS Clinical but i want to. hehe.....at least I am not alone on the pickin'! Thanks so much for following and I will announce the lucky winners next Monday! Girl, you will seriously fall in love! iS Clinical is one of my all time favorite brands. Thanks for following and we will announce all of the lucky winners next Monday! Thanks for participating! You will definitely love iS Clinical products. Stay tuned as we will announce the lucky winners next Monday! I would love to try the pro heal. I use active serum and hydra cool already. My friend raves about pro heal, and is on my list of products to buy. I tend to get cystic breakouts, and have lots of acne scarring. Pro Heal definitely cuts the healing time down dramatically! Congratulations ladies! You are ALL WINNERS! I will be emailing you shortly for your shipping information and thanks for your participation! Hello again! Can you please provide me with your email so I can forward you the samples? Thanks a ton and congrats again! Hi there! We are throwing in your sample with the recent sunscreen win. Congrats again! I know I'm late but the Active Serum sounds great. I've heard a few people comment on how great it is.